It is not known when the first church was built in Woodhurst. In the Domesday Survey it mentions two churches for Slepe (the former name of St Ives). As Woodhurst was included in Slepe one of the churches could be one in Woodhurst. The oldest part of the present church dates from the 12th century. This is the north wall, which has a late 12th Century doorway. The south aisle was built in the late 14c. There are four bays with pointed arches and round columns with moulded bases and capitals separating this aisle from the nave of the church. These columns were at one time brightly painted and evidence of this can be seen if you look carefully. A consecration cross has been scratched into the column nearest to the altar in the south aisle. In the window nearest to this altar there is a late 14c piscine with an octofoil basin. The brick floor of the nave and south aisle was laid during the latest restoration in the 1980s. The present chancel, which is built of yellow brick was built in 1848, nothing is known about the previous chancel. The pepper-pot bell turret is early 17c. There are three bell pits but only one bell made by W Haulsey of St Ives dated 1624. A recent visit by an expert in church bells revealed that the bell pits are considerably older than 1624. This indicates that the present tower replaces one that was probably damaged. In his will dated 1528 Richard Carter gives 20d to the bells. It is probable that when the tower was built the roof was raised and the clearstory windows added. The font is a 13th Century octagonal bowl with a tapered stem, which is more modern. The carved wooden cover was made in 1990. The 16th Century oak chest is in two divisions; the top has four strap hinges and a slot for money. Amongst the pews and four made up of early 17c panelling, two pews carved with designs, one with the date 1631. It is said that they may have been made from panelling at the old Manor House. The three pews at the back were brought to the church when the chapel closed. The kneelers have been made by parishioners, many to celebrate special occasions. Three items of church plate given by Mrs Frances Browne, the lady of the Manor in the 18th Century, are kept in the bank. These are a silver chalice, and a silver plate and paten dated 1763. The silver chalice and paten used monthly for communion were given by the Gurry family in 1933. The Bible was presented by the family of the late Jack Walter Game Marjason by his wife and family in 2000. 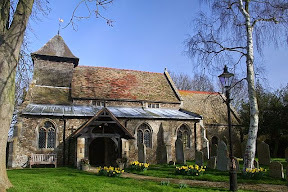 Woodhurst was a chapelry of St Ives until February 1968 when it was transferred to the parish of Broughton. The first documentary evidence that it belonged to St Ives is in a Cartulary from Ramsey Abbey that a Papal Bull was published confirming that the chapels of Wodehyrst and Woldhyrst are chapels of the church of Slepe. The name of the church has changed over the centuries; in 1539 it was known as ‘All Hallowes’; In 1557 it was known as ‘All Saints’. When the name changed to St John the Baptist is unclear, as the church registers that are still in existence do not begin until 1690. It is not until 1738 that evidence emerges that June 24th (St John the Baptists Day) began to have special significance for the parish. Many children were baptised on that day, some were married, and it became a holiday for parishioners. If it fell on a Friday dispensation was asked for, so that meat could be eaten on that day. Now in the 21st century the week during which that date falls is known as Feast Week and special events are organised for the village. Over the centuries numbers of people who attended the church have changed. There was always a band of Dissenters in the village and in 1798 a small thatched barn was built to be used as a Baptist Church in South Street. In 1841 a substantial brick chapel was built in Church Street by Longland Ekins. Many parishioners attended this Chapel, and there was much rivalry between the two establishments. The Chapel is now a private house. In 1981 the church was in such a serious state of disrepair that a meeting of parishioners was told that there were four alternatives. To hand it over to the Redundant Churches Fund which could decide whether to preserve it or not. If it preserved it there would be three services a year and special services. The church could be demolished. As it was a listed building permission would have to be sought. It was decided to repair the church. Years of fund raising followed and finally on November 28th 1990 the Bishop of Ely came to a Thanksgiving Service in the church. During this period the congregations attending services grew. Attendance today is small, but the church is full for weddings, baptisms and funerals; and celebratory days such as Feast Week, Harvest and Christmas. During March 2012 part of the outside east wall of the nave of the Church fell down. Luckily no-one was in the area at the time, but the damage was quite extensive as can be seen in the pictures in the gallery. There was a fantastic response to the appeal for money to repair the church with donations from friends both in the village and overseas. There were also generous grants from Cambridge Historic Churches Trust, Garfield Weston Foundation, Huntingdonshire District Council and Allchurches Trust. So much money was raised that we were able to redecorate and repair the inside of the church as well. Our family service on June 16th was graced by the presence of the Bishop of Ely who re-dedicated our restored church.